HP has given the 13-inch Spectre x360 2-in-1 laptop a new lease on life with an attractive redesign, improved hardware and a massive boost to battery life. HP’s Spectre lineup of laptops is designed to be thin, light and packed full of power, and this year’s HP Spectre x360 refresh carries that torch. Previous HP Spectre x360 models have been stylish and powerful 2-in-1 devices, with the ‘360’ of the name a reference to the hinges that allow you to rotate the screen 360 degrees around the keyboard. The 2019 edition of the HP Spectre x360 updates the internals to more modern components, while also making some stark updates to the design. It’s still the slim and stylish 2-in-1 we’ve come to expect, and with previous Spectre x360 laptops being some of our favorite 2-in-1 devices we’ve tried, the HP Spectre x360 (2019) has both a strong base to build off, but also big shoes to fill. This is the latest model of HP's 2-in-1 Ultrabook. As with many of HP’s laptops, there is a variety of models of the 13-inch HP Spectre x360 (2019) with various specifications and prices to match. The base model comes with an Intel Core i5-8265U processor, 8GB of RAM, 256GB PCIe SSD and a full HD (1080p) IPS touchscreen. This sells for $1,009.99/£1,199/AU$2,499. For an HP Spectre x360 with an Intel Core i7-8565U and 512GB of PCIe SSD storage (with the rest of the specs the same), the cost rises to £1,399. In the US and Australia, the RAM gets bumped to 16GB for $1,329.99/AU$2,799.01. The US also has a version of the above but with a slightly slower Intel Core i7-8550U processor for $1,179.99. Meanwhile, in Australia, you can get a Spectre x360 with the same components as above, but with a 1TB PCIe SSD for AU$2,999. If you’re after a 4K screen, 16GB of RAM and 1TB PCIe storage, the price is £1,699. In Australia, you get a 4K display, Core i7-8565U processor, 16GB RAM but just a 512GB PCIe SSD for AU$3,399. It doesn’t look like a 4K version is currently available in the US. To make things a bit more complicated, Australia also has two models that don’t appear to be available in the US and UK. Both of these models have SIM card ports for using 4G mobile broadband. The first model has an Intel Core i7-8565U processor, 8GB of RAM and 512GB M.2 SSD for AU$3,199. There’s also a model that comes with 16GB of RAM and 1TB PCIe SSD for AU$3,799. There are also 15-inch models of the HP Spectre x360 which feature a faster Intel Core i7-8750H processor. We’ll be reviewing the 15-inch model separately. So, there’s certainly a selection of configurations available, but to make matters more confusing, not every model of the Spectre x360 is available in all markets, so you may find your choice narrowed depending on where you live. You can use the HP Spectre x360 as a tablet device. Also, while it is slightly bigger than last year’s model, the new look of the HP Spectre x360 (2019) makes it a far more desirable 2-in-1 than the 2018 version. The design of the HP Spectre x360 (2019) has benefited from some subtle changes compared to 2018’s model, most noticeably on the top left and right corners, which are now diagonal, which gives the Spectre x360 a more interesting look. On the left-hand corner is the power button, and on the right is an additional USB-C port. The speaker grille that runs along the top of the keyboard has a slick, new design, and the speakers behind it are again supplied by Bang & Olufsen. There is also a fingerprint scanner on the right-hand side beneath the keyboard, and this allows you to log into Windows quickly and easily by placing your finger on the sensor. The touchpad resides in the center below the keyboard, and it’s large enough for comfortable use. However, in regular use, the touchpad isn’t quite as responsive as we would like, though on the whole it recognizes multi-touch gestures. Still, it isn't quite as smooth as the touchpads we’ve used on other laptops. The keyboard feels nice and responsive. The keyboard, however, is much more successful. Despite the thinness of the HP Spectre x360 (2019), the keys offer enough travel to feel responsive and satisfying when pressed. There’s no numpad, but that means HP could spread the remaining keys across the length of the Spectre x360, and they are a decent size which is good news for fast typers. This means that in laptop mode, the HP Spectre x360 (2019) remains a comfortable device for working on for long periods of time. You might just want to invest in an external mouse, rather than rely on the touchpad. On the left-hand side is a single full-size USB-A 3.1 port which is a nice addition, as many of us still have devices that don’t come with a USB-C port. Having this standard USB port means you can use older hardware without the need of a dongle. On the right-hand side are two USB-C ports – with one located in the diagonal corner of the HP Spectre x360 (2019)’s body. This is quite a handy place to have it, as it means any peripherals (or the USB-C power cable) are angled away from you when in use. There’s also an audio jack port, microSD port and a physical switch that lets you disable the webcam, which again is a nice touch for the privacy-conscious. As with all of HP’s x360 models, the HP Spectre x360 is a laptop with a 360-degree hinge for its screen, which allows it to be used as transitional laptop, as well as rotating it all the way back to be turned into a tablet-like device. You can also set it up in a ‘tent’ mode (as an inverted V) and use it to watch media on. The high build quality of the HP Spectre x360 means that the hinge feels sturdy when used, so you won’t worry about damaging it while you angle the screen into a variety of positions. The laptop's 30.88 x 21.79 x 1.47cm (W x D x H) dimensions and 1.33kg weight makes it easy and comfortable to carry around, and it’s not that much larger (or thicker) than last year’s model at 30.6 x 21.8 x 1.36cm and 1.26kg. So, yes, the Spectre x360 is getting bigger and heavier, but not by too much, and considering the specs upgrade (which we’ll get to in a bit), that trade-off isn’t too bad. The HP Spectre x360 comes with a stylus included. 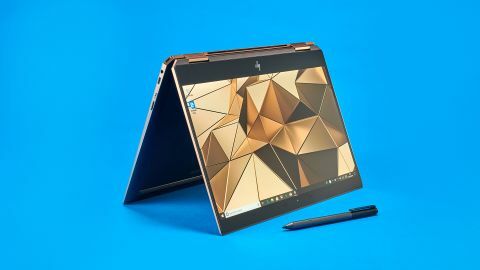 HP also appears to have improved the screen since last year’s model, with the display of the HP Spectre x360 (2019) looking much more bright and vibrant than its predecessor. The model we were sent for review came with a 1,920 x 1,080 Full HD screen that’s 13.3-inches in size. The display is protected by Corning Gorilla Glass NBT, which is essential for any 2-in-1 device to protect it from being scratched when in tablet mode. Naturally, it’s a touchscreen, and it works well enough using a finger, though the HP Spectre x360 (2019) also comes with an included stylus (more on that in a moment). The screen panel uses in-plane switching (IPS) technology, which produces wide viewing angles. Again, because you can rotate the screen to place it in various configurations, this ensures that image quality remains high no matter what angle the screen is positioned at. The HP Spectre x360 (2019) also comes with HP Sure View technology built in. By switching this mode on, you can limit the viewing angles drastically, which is handy if you’re working in public places, as it makes the screen hard to read by other people who aren’t sitting directly in front of the screen. This feature can be turned on and off using the F1 button on the keyboard, and it works impressively well, with the screen looking extremely washed out and unreadable when looked at from an angle. Looking at the screen straight-on, the image is a little more washed out than usual, but still perfectly usable. While not many people will ever use this feature, it’s nice to have and works well. There are also models of the HP Spectre x360 (2019) that come with a 4K screen. For many people, a 4K screen on a 13-inch laptop will be a bit overkill, but it’s a welcome option. Though, as we mentioned earlier, the 4K option isn’t available in all markets. Use the laptop in 'tent' mode for watching media. In action, the screen does a good job of displaying apps and media, and though it wasn’t the brightest screen we’ve seen on a laptop, it does the job well. It’s worth noting that HP has included large bezels along the top and bottom of the screen, which is a bit of a shame as we’re used to laptops at this price point having extremely thin bezels (such as the Dell XPS 13), which gives you the most screen real estate possible while looking sleek and modern. The big bezels on the HP Spectre x360 (2019) display, on the other hand, feel a bit dated. The HP Spectre x360 (2019) also comes with the HP Active Pen stylus. It’s a solidly-built device that feels nice to hold and works well with the x360’s touchscreen. The fact that HP has included it with the Spectre x360, when many of its competitors don’t, could and should be a major selling point.